Last weekend saw me return to Rhayader, in the Elan Valley in Wales. For the last two years I took part in the Rhayader Mountain Trail, a 30 mile event. The first year I took part I was really caught out, never having tackled an event on such tough terrain, and was poorly prepared mentally, for what to expect. You can read about that experience here. Last year I went back to face the demons! I knew what to expect, and though it was tough, I took it all in my stride and finished in 7.5 hours. The weather was wet, bleak and miserable on both occasions. There was low cloud, marsh, peat bog and "babies heads" (the industry standard term for ankle-breaking tussocky grass). This is all perfectly normal for Rhayader, in summer. 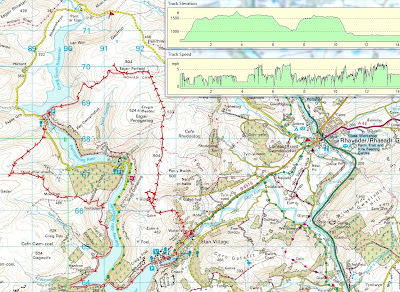 This years Rhayader Mountain Trail was to be held in July, a month earlier than normal. It was cancelled 4 or 5 weeks before the event due to low numbers. I thought cancelling an LDWA event a month before was a little premature. I rarely enter an LDWA 2 or 3 weeks in advance? I tok my girlfriend there for a weekend training. It was however a B&B, and not a tent we stayed in. Luxury by all accounts. We arrived late on Friday afternoon, and went out for a meal in nearby Llandrindod Wells, at the Metropole Hotel, which was very nice We got up at 7:30am on Saturday, had breakfast and drove to the Elan Village visitors centre and parked there. I roughly sketched a route out that would take in some of the areas I had covered in Rhayader previously, as well as some new bits too. 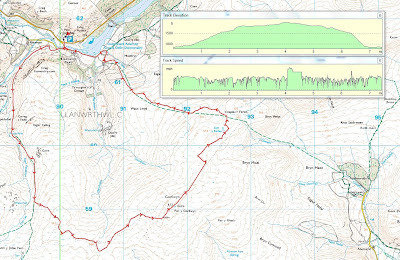 Below is the route, as recorded by my GPS, and shows the elevation and speed profiles too. True to Rhayader form, 5 minutes after starting the route we we putting on full waterproofs, which then stayed on all day. It rained all morning, but did brighten up (though stayed quite cool) in the afternoon. I had the PDA/GPS along to record the route, and not to navigate from. This was to be a training exercise too, so map reading and navigation all weekend. I had selected some random points on the map that we would navigate to, and then check on the GPS to see if we had found the right place. There was a steep uphill climb immediately climbing Y Foel, and then navigating to a small tarn (pool of water) on Y Glog Fawr (these are hill or mountains names incidentally). I was navigating this section, and found the tarn successfully. My girlfriend got an immediate taste of quite nasty boggy and tussocky terrain. The weather took a turn for the worse. It got quite cold and windy and I seriously considered returning to lower ground, but we stuck it out and the weather improved. The rain had eased off, and cloud had lifted a little so we carried on with the intended route. Next we navigated across the moorland, sometimes on temporary 4x4 tracks, sometimes on a footpath, but more often than not just trudging through rough and wet terrain. This was one of the few tracks that we found up on the hills. Here, typical Elan Valley scenes of hills and reservoirs. We reached the trig point that we were navigating to. An easy point to reach, but it served as a gateway to the next point, a Roman Camp, which was essentially invisible on the ground now. My girlfriend took over navigation, and steered us for one corner of the camp. We learned a valuable lesson in reading the ground in Rhayader. If it looks flat, avoid it! We crossed a large depression on flat ground (between the trig and the roman camp as marked on the map), which was simply an invisible to the eye marsh until you were in the middle of it. Lots of tussocky grass, and very little of the tall, tell-tale reeds that usually give water away. We got very bogged down and progress was slow. We would have saved a lot of time by contouring around on the higher ground. That was a valuable lesson learned. We reached where we thought the camp was and I confirmed it on the GPS. The next section was on an old Roman Road, which is just a grass track now. I had been along this twice before, so carelessly followed the path instead of navigating properly and had to double back a few hundred metres at one point. We were headed towards the dam on the Craig Goch reservoir, which shows a footpath, but at least 50% of the path no longer exists. It is only the late sections around the water that do. I knew this section from memory, so I let my girlfriend navigate. We spotted two people who were looking very lost, and they had a tandem bike with them - not the terrain for a bike! They spotted us and headed over to us as we headed down and joined the footpath that lead to the dam. I took this photo looking down to the water from that point. We managed to run this next section, all the way around to the dam. A mile or so later the tandem bike couple caught up and came over and said that they were indeed a little lost and were pleased to see us, so they could find the right track. A good lesson for Rhayader is that not all of the marked footpaths (in fact I would say very few) actually exist on the ground. Here is me on the dam itself. A photo looking back to it, after we had crossed it. I took over navigation and we headed up a steep hill (Y groes) following a broken down wall. After this point I navigated us towards the source of a stream just over 1km away. The terrain turned into full on "babies-heads". A shot of my girlfriend standing up to her thighs in the long tussocky grass. This stuff really tires out your ankles, if it doesn't twist or break them. We got to the stream about 100m before it source, but rather than just follow it up, we decided that it was a pointless exercise as it was easy enough to follow it, and we would continue onto the next point. We were to try and follow a path that shows on the 25,000k map, but not the 50k. The path simply did not exist. We trudged through 2km of quite the most difficult miserable tussocky terrain imaginable. It doesn't look it, but this stuff is vile. In the distance, but along the path I spotted a familiar but oddly placed object, and went over to it for a closer look. Bear in mind we are up on a 500m hill on moorland at the moment. My girlfriend looking back to the other side of the valley where we had been earlier. We next navigated to a forest corner and wide track that I had been down twice previously, my girlfriend demonstrating her cagey descent technique, which still insists she will work on before October. We were now back down at 200m, the rough level of the reservoirs and headed into woodland along a narrow twisting path. We ran along this path, and all the way back to the crossing at Garreg-ddu reservoir. From here it was all tarmac cycle track back to the car. I was wearing some new fell shoes; Inov8 Mudclaw 270's. These are very aggressively solved (6mm tread studs), and have little cushioning, so running on tarmac is not pleasant or advised. My right foot, still bruised from last weeks training, so I opted to walk the last 1.5 miles for the sake of my feet. Here is a few photos of the dam and area by Caban-coch reservoir, right near the visitor centre. We got back to the car in just over 7 hours, having covered 15.2 miles, 2650ft +/- elevation, and averaging around 2mph. It sounds pathetically slow, but 2mph (or slower) is tough over this ground, so we were very pleased with that. We had a quick coffee in the visitor’s centre, just before it closed and then headed back for a meal at the Elan Hotel. This wasn't anywhere near as good as the Metropole the previous night. For starters is appeared many things on the menu had either run out or "weren't made up" that night. I struck lucky after about 3 different choices though. The poor waitress, who was pleasant, was being it seemed unfairly berated by the landlady. Felt sorry for the poor girl, glad I don't work for that woman. We headed back to sleep. We got up early again, had breakfast and were out walking for 9am. We parked in a different location a little further past Elan Village, oddly enough at one of the checkpoint locations from the Rhayader Mountain Trail. I was a little apprehensive about the route (having been over the terrain in the previous two years), and had created several options allowing for short-cuts in the event of the weather turning too miserable. As it was, we did opt for a shortcut. The actual route we took is shown below. We wore our waterproofs from the start, mainly because I knew the ground would be wet and it would likely be cold and miserable up on the higher ground. We crossed a bridge immediately where I took this photo. We joined a wide grass path that would take us up, in between Drygarn Fawr and Gorllwyn, the two highest mountains in the area. Nearing the top we turned off the path, and followed a bearing which took us to one of many small standing stones which I believe are actually parish boundary stones. These stones often but not always mark the best path to take through the moor, and sometimes peat bog. It is pretty bleak up there, even on a good day. We headed for the summit of Gorllwyn which is shown here in the distance. Here, me heading off to cross another peat bog. Please, no more tussocky grass or peat bogs. I found myself up to my waist in water and up to my knees in peat bog in Rhayader in the past two years. I had to be hauled out of the bog last year as I was stuck solid, both feet sucked in. The visibility was somewhat better at this stage, than previous years, so I managed to cross them and keep my shoes on this time. Finally we got to the summit of Gorllwyn, but we started to lose visibility in the low cloud as you can see. It also started to rain too. In fact it drizzled fairly consistently most of the day. We continued on, but looking back in the direction from which the wind was blowing, it looked like poorer weather was closing in. Also, checking our watches, we were running short on time to travel back home. We checked the map and decided to head North East for 1 mile, sometimes following the stones, but often choosing better (drier) ground. After this we would pick up the path, shown on the map, than runs West and then North West, off the mountain and back down to the car. We navigated just past the small tarn and expected to find some kind of path, but rather predictably there was no path to be found. I double-checked our location on my PDA/GPS and sure enough we were right on the "path", which just failed to exist. We took a bearing and started to head down. The ground was very poor, lots of marsh and water, and plenty of babies heads to keep our ankles busy, until the lower slopes where better grassland prevailed. I took one final shot, again a typical Rhayader scene of reservoir, moorland, and some forest too. We eventually got back down and back to the car. Only 7.5 miles travelled, 1400ft of +/- elevation, and averaged 2.5mph. All in all in was a nice weekend. We both learned some valuable lessons about the terrain in Rhayader, and both did well on the navigation side too.